It always feels satisfying to start the first seeds of the year. Like every other year since I've started gardening, my Imperial Star artichokes are the first to be sown. 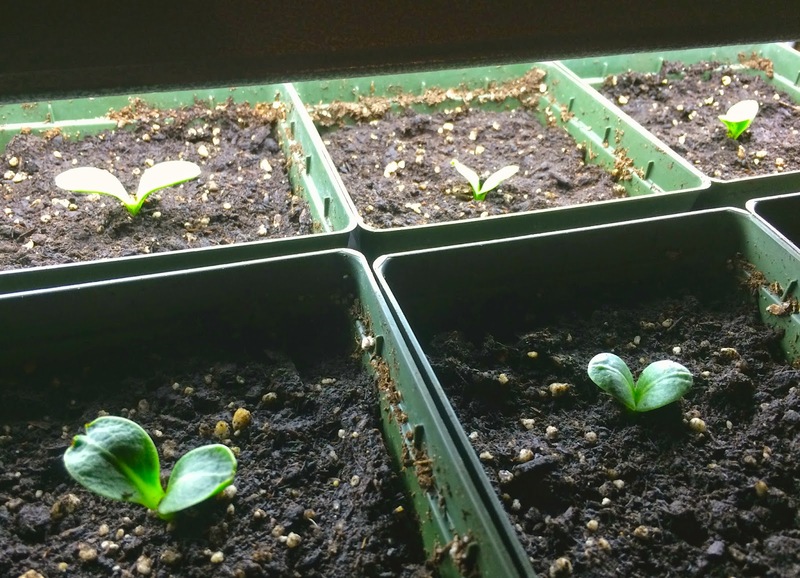 It's important to start them early as they need a minimum of six weeks of growing indoors (in a warm environment) and then another six weeks of cold treatment outside to inducing budding the first year. Artichokes generally start flowering in their second year so this cold treatment tricks them into believing that they've experienced winter. They're tender here in New England so for those six weeks, I cart them in and out of the house if ever temperatures dip below 35 degrees. It's well worth it though. We had a good crop of artichokes last year. They don't grow as big as the ones from California, but are just as tasty. I allowed many of them to flower completely last year, adding a lot of interest to the flower borders. This year, however, I think I'll reserve them for the dinner plate. One final tip - I like to soak the seeds for 24 hours and then pre-sprout them within a damp paper towel sealed within a plastic bag. Sow the seeds in individual pots when the seed coats start to open. Those blooming artichokes are so pretty - but if I had to choose, I would probably prefer using them in the kitchen too. I'm with Margaret. They are oh so pretty, but I'd eat them in a flash. You are a very dedicated artichoke grower and it certainly seems to pay off. I have one potted plant that usually produces at least one flower every year, but I let it bloom, it's so beautiful and I love to watch the bumblebees swim through the stamens. It's much easier to buy them at the farm stand here, they are available practically year round and usually very reasonably priced. They do indeed make a very pretty addition to the flower bed! Beautiful!! I have to try artichokes someday, the flowers are so pretty. Growing artichokes is something I have wanted to try but I just don't have the space to do it. I'm sure your home grown chokes taste much better than the store bought version. what size pots do you plant the seedlings in? I am considering doing these for our garden border next year. We are in zone 6a - which i realize makes it tough but you have given me great hope that we can be eating one of my all time favorite veggies grown in our back yard!